I want to see what's "hidden" in your baskets. I have a few, for wool, rug hooking supplies, quilting supplies, patterns, wool snippets (saved to stuff pin cushions) and even one to hold my supply of homespun fabric. There is always a use for a basket. I would enjoy seeing your basket contents. I too have strategically placed baskets and containers holding the necessary tools to do various handwork. Stitching is what keeps me sane, well some would argue that I'm sane, lol I will be so glad when this election is OVER! I have done the geraniums as well, once you start you just keep going and end up with a lovely piece. Now back to my regularly scheduled stitching. Evening, oh I would enjoy peeking into those baskets.Can never have to many baskets.... Hope your mom is ok.Blessings Francine. I will agree it seems like the world is out of control and some type of hand work is soothing. I feel blessed that I have my hand work and creative outlet, it keeps me sane in an insane world. 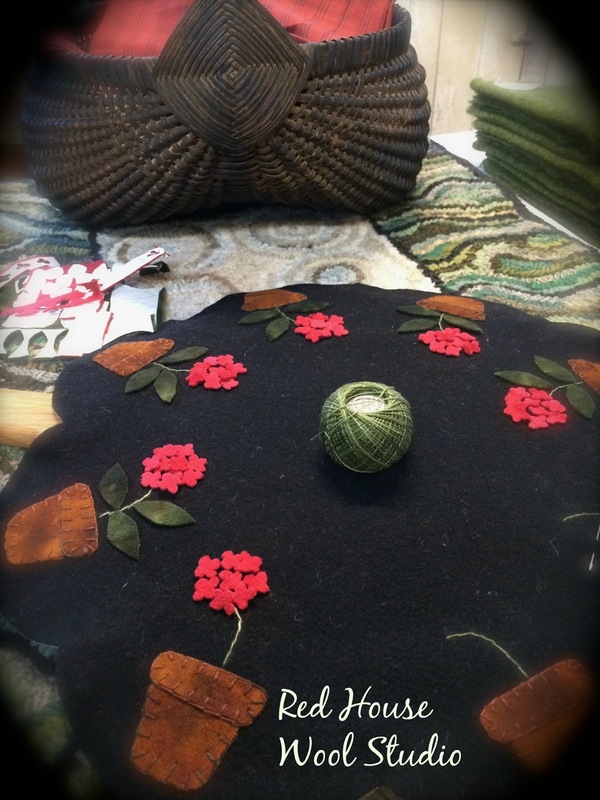 Love the wool mat, that is a beautiful design and beautifully made. So glad to hear from you. We all enjoy your updates. I would love for you to give us a picture tour of your studio (including all your baskets) . I have seen bits and pieces of your studio but never a tour. I love your red geraniums. Kathy, just reading your post made me feel relaxed and calm. Thank you! It does seem that the older I get the more I feel like I'm not living to the fullest but spending (wasting!) my time on the petty details of life. My handwork is the saving grace along with the kitties. Love the red geraniums! They are my favorite flower for color on the front porch in summer. Such true words. I don't know what I would do if I didn't have something to keep my hands busy. I think handwork is such a joy of life. It was so fun visiting with you yesterday. Your shop is amazing, warm and inviting. Surrounded by all the beautful colorful wool is soothing in itself.